Is Mohammad Aamer the next Wasim Akram? Despite the 2-0 whitewash of the Australians in the T20 series just concluded in England, which by the way feels extremely good, Pakistan has had a torrid year or two of cricket. Yes there was the World T20 win last year but besides that the team has generally gone through a very turbulent period. Amidst all the negatives, Pakistan has shown the world a glimpse of the future of their cricket in the form of Mohammad Aamer and Umar Akmal. I haven't written much about both the talent powerhouses since their rise in international cricket has coincided with my fall in the blogging world, but I feel now is probably the right time to start bragging about these two youngsters. They've been around for a year now and they have made such an impact that the world is taking notice. Aamer is the future of Pakistan's bowling attack and he is already being compared to Wasim Akram, arguably the best fast bowler to play international cricket. While Umar Akmal is already the backbone of Pakistan's batting line up. He attacks, he consolidates, he drops anchor, he smashes the opposition apart, he does it all. And boy can he bat! After Pakistan's first T20 win over Australia at Birmingham, Rameez Raja made an interesting comment. When Ian Ward compared Aamer to Wasim Akram, Rameez said at 18 years of age, Aamer was far ahead of what Wasim was when he was 18. Quite a bold statement from Rameez! Aamer is probably a couple of years older than his "official" age of 18, but for the sake of argument lets assume he is 18. Rameez's statement means that Aamer is far better than Wasim was when he started off in international cricket. I didn't watch Wasim Akram till the late 80s so I can't really compare the two at the start of their international careers, but I dug out some stats to check on how they both fare head to head. Aamer has played 8 test matches and 15 ODIs for Pakistan, and his figures in tests are not much to write home about. He has taken 21 wickets at an average of 42.38 and has one 5 wicket haul. His wickets have not come cheaply in the tests he has played against Sri Lanka, New Zealand, and Australia. Wasim Akram started his test career against similar opposition playing his first 8 tests against Sri Lanka and New Zealand; and in only his 2nd test he managed a 10 wicket haul against the Kiwis. Wasim Akram took 7 more wickets than Aamer did in his first 8 tests and at a far better average than Pakistan's young new left armer. Aamer is talented; he is Pakistan's future; but he is no Wasim Akram. In ODIs, on the other hand, Aamer has made his presence felt. 25 wickets in 15 matches at an average of 24.00 and an economy rate of under 5 are figures of a world class pacer. His strike rate of 31.5 is also up there among the best in the world. The economy rate of 4.56 speaks volumes of Aamer's control over the new white ball. In modern times when all batsmen go for leather like hungry sharks during the power plays, maintaining an economy rate of under 5 is a remarkable achievement. Even more so for a young fast bowler playing in only his first few international matches. Compare those stats to Wasim Akram, and we see Aamer in a different light. Wasim managed only 17 wickets in his first 15 ODIs at a slightly higher average and a considerably higher strike rate. So is Aamer more talented than Wasim Akram was in his youth? I can't really say. But Wasim Akram ended his career as one of the best fast bowlers of all time and safely as the best left arm fast bowler ever to play the game. Can Aamer reach that status? If he comes close, he would have had an awesome career and I can't wait for that to unfold in front of my eyes. Tomorrow: Umar Akmal compared to the modern day greats. Wasim Akram had Imran Khan as a mentor... Aamer has Waqar Younis now.... ohh what lovely combination. And like it happens with every youngster, they will be worked out! Cricket teams around the world are taking notice of their performances. There will soon come a time when their weaknesses will be discovered and exploited. If they come out of such phases in their careers as stronger individuals, they will undoubtedly be counted amongst the legends of the game. Till then, lets just wait and watch it unfold... as Q said... in front of our eyes. Hi guys.. thanks for the comments. comparisons are inevitable especially with someone like Aamer who was handpicked by Wasim to represent Pakistan.. and his run up and action are pretty much modeled on Wasim Akram.. even his celebration is exactly the same.. so comparisons will always happen. Having said that I just wanted to compare the performances of the two bowlers at the start of their careers based on what Rameez Raja said.. mostly to see if there was any evidence for what he suggested. But SP, u r right.. Mohammad Aamer is Mohammad Aamer..
Babar, the point is not to compare the Sri Lankas and Australias of the world.. that was just an observation that they played similar opposition.. ur right the teams were very different in the 80s... I was just trying to see if there was enough evidence to support or discard Rameez Raja's claim.. 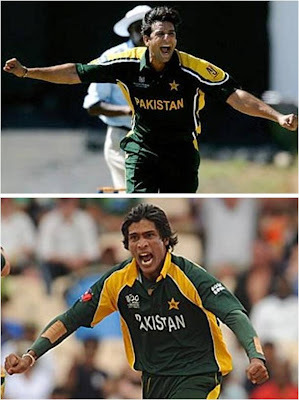 The question is, has Aamer had a better start to his career than Wasim or not? Though, I would like to thank on behalf of the visitors for making an effort and highlighting those stats. Good article. Agreed - no conclusive evidence based on numbers. So I'll limit my comments to just my observations. Aamir is definitely very talented and matured for his age. Wasim was very erratic with the new ball until the mid-90s. Its unbelievable how well Aamir controls the new ball at such a young age. Like Wasim, he is clearly a big match player and relishes responsibility. I hope Aamir aspires to be as good as the 30 year old Wasim (not the 18 year old one). For that he has a lot to learn. The good news is that from evidence so far, he is a quick learner. Looking forward to your analysis of Umar Akmal. Even greats like Miandad and Inzi didn't have good records in New Zealand and Australia. Umar has made his name playing only against those oppositions. His technique isn't as compact as Inzi's or Miandad's. I feel players with weak techniques find it harder to recover from bad form. So I'll wait until he goes through one bad patch before giving my verdict on him. I am extremely disappointed to not see Fawad Alam in the squad. Don't know what the selectors are smoking. I don't want to mess with Salman/Imran combination as they showed some consistency in Australia. So that leaves Yasir/Umar Amin/Azhar Ali for number 3. They didn't try Azhar Ali in the one first class game. So I'm assuming he's behind Yasir and Umar Amin in the queue. I think with Asif, Gul and Aamir in the team, Wahab and Tanvir don't have a chance. After Kamran Akmal's exceptional performance behind the stumps in T20, I think Zulqarnain will have to wait for his chance a little bit more. Wasim has better test stats because he played his opening tests in good bowling conditions, if you examine the stats most of those games Wasim played were not high scoring ones, on the other hand Aamer played in high scoring games against great batting line-ups of SL and Australia. Wasim couldn't bowl reverse swing or swing the ball both ways until he was in his early twenties, Aamer can do it at 18, so he is better than Wasim at this age. In his 20's though Wasim became hands down the greatest fast bowler of his generation. Even I was disappointed with the omission of Fawad Alam. He has shown time and again that he has the ability to play test cricket but he continues to be ignored. No idea why. Umar Amin and Azhar Ali have both shown strong performances at the domestic level .. I have high expectations from both.. lets hope they can shine tomorrow.